The best motorhome carport there is at a surprisingly great price. 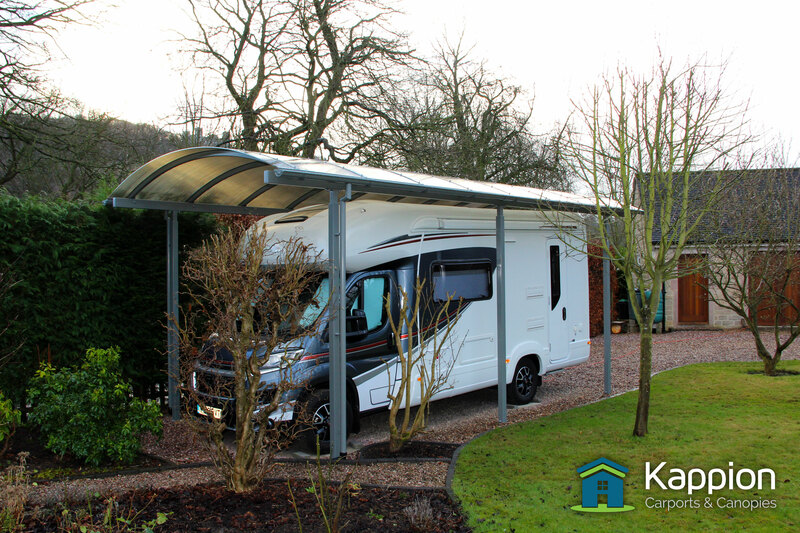 A motorhome canopy protects your expensive and prized possession from the elements throughout the year. Covering your motorhome helps you to keep maintenance to a minimum and ensures that the seams and joints are protected from the weather. Under normal circumstances your motorhome is not used on a daily basis so when the time does come to go out on an adventure, the last thing you want to be doing is washing the vehicle, removing any leaves or moss which have appeared since the last wash and trip. Our motorhome canopies are hot dip galvanised for complete rust protection and then powder coated to your chosen RAL colour. This gives you a long lasting finish. All canopies are glazed with 10mm thick multiwall polycarbonate which comes in 3 colours. 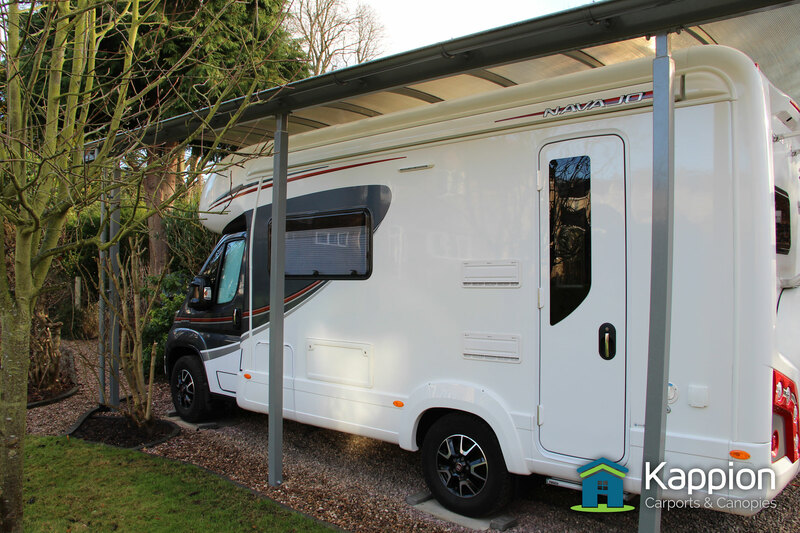 A motorhome canopy will protect your motorhome from the weather and could dramatically reduce the amount time spent cleaning and preparing the vehicle. A canopy allows you to load your vehicle and do all of your pre-trip checks in the dry, under the canopy. 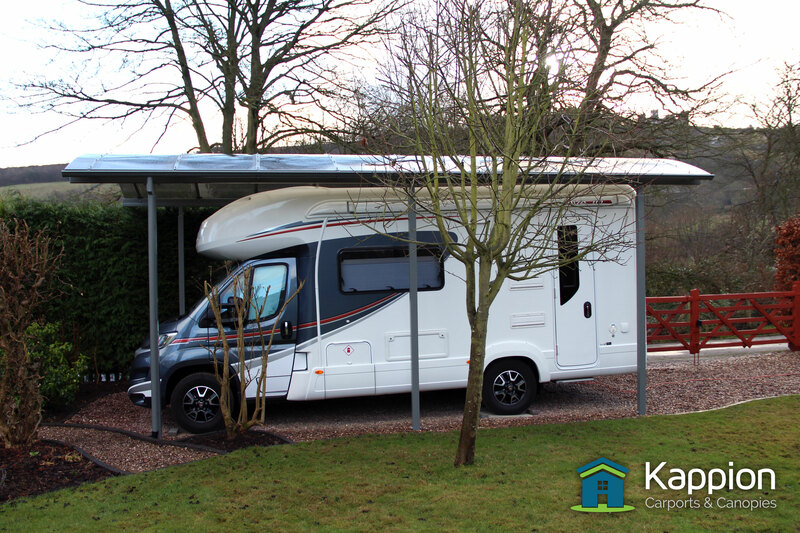 When you return from your trip, simply park your vehicle under the canopy where you can be sure that your motorhome is once again protected from the elements. 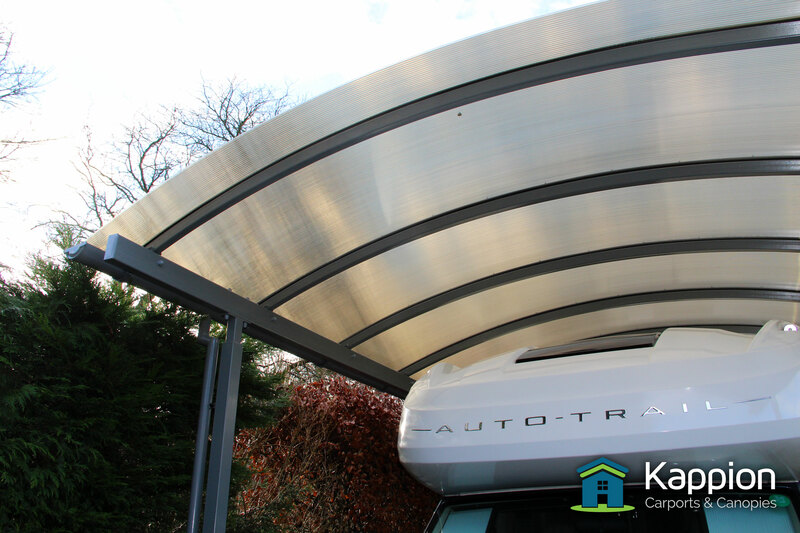 When you commission a motorhome canopy installation with Kappion Canopies you can be reassured that it will be custom designed and structurally engineered to work with your geographic location. It will be designed to withstand the snow loads and wind speeds for your area. 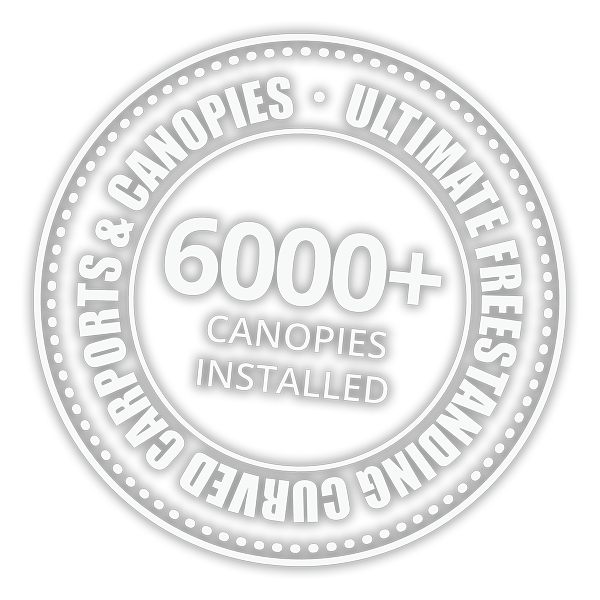 The canopies we install are made from steel for ultimate strength and resilience. They are hot dip galvanised for complete rust protection. Once galvanised the canopy will be powder coated to your chosen RAL colour. The roof will be glazed with your colour choice of long lasting 10mm multiwall polycarbonate, which includes a protective UV layer on the top. Finally, guttering and downpipes will be designed to meet your exact requirements, which will allow water to be directed to the nearest surface drain, keeping the area dry. Thinking about purchasing a motorhome canopy? If you would like more information please get in touch. If you would like to request an estimate please use our Get a Quote! enquiry page.